In one of the interviews I did recently I was asked if I took seriously the notion of “carrying sins”. I answered that while I tried not to take myself too seriously, I absolutely did feel the responsibility and weight of the “confessions” that had been made to me. They were privileged information and profound acts of trust, and I treated them that way. If you have read the book, you will know that one sinner gave me the sin of gossip to carry. It would have been easy to make “gossip” of the sins, but I never spoke of them on the road, and it is only with permission that I name them in the book. I sincerely hope I will go to my grave without putting the names of sinners to the sins. It was a conscience-check for me, and a cause for heaviness of heart until I had wrangled with it, and myself. Today, I was sent the link to the app above. 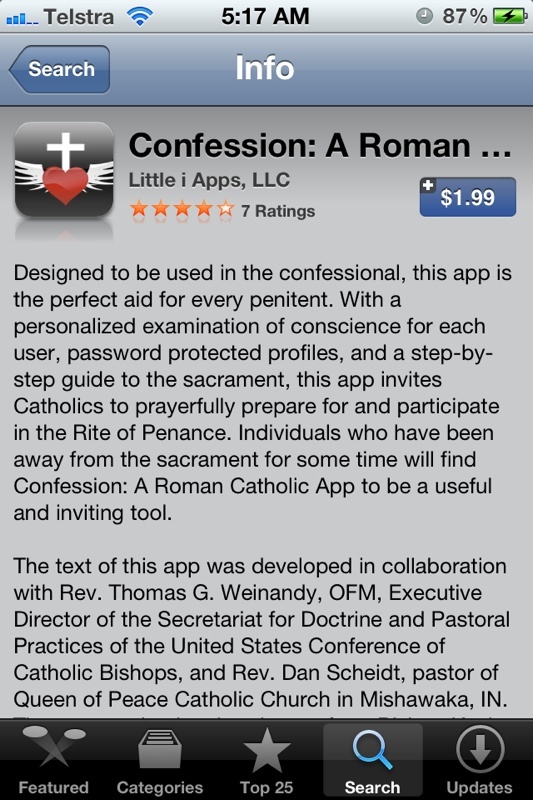 And I’m curious about how it is to be used when in the confessional. Perhaps I will have to lash out and buy it. I may have to take a long walk to consult my conscience first. Oh, this is so tempting. I’m starting to go to Mass after over forty years “in the wilderness”. I had made up my mind that confession was an unnecessary ritual and that any “sin” I carried by taking communion without first confessing was a contrivance. I guess I don’t need to take communion either. But, I am about to start on The Camino, so I’d better get it right. Why don’t you buy the app and report on its functionality. Besides, I don’t have a phone and taking a computer to confession may just stretch the friendship a bit. Or maybe not. It sounds like you are on an internal camino too! With the way we are whirling in cyberspace, I imagine that confession via Skype might be next. Whatever works. Most of the sins I carried were confessed via email, and the results were still potent. I became a great believer in owning up to another human being. As I say in the book – eye-to-eye admissions of the shortcomings that linger and give us pain do seem to lead to transformation. So far I can only report positive results from my courageous “sinners.” So maybe there is a big future in digi-confession. But paying? I want to know where it sits on the simony scale!